Travelers who get the heebie-jeebies just thinking about swimming in nature need not fear when heading to Kampot. The Teuk Chhou River calls daily for bathers to seek refuge from the unrelenting Cambodian sun in its cool water, but some prefer not to answer the invitation. 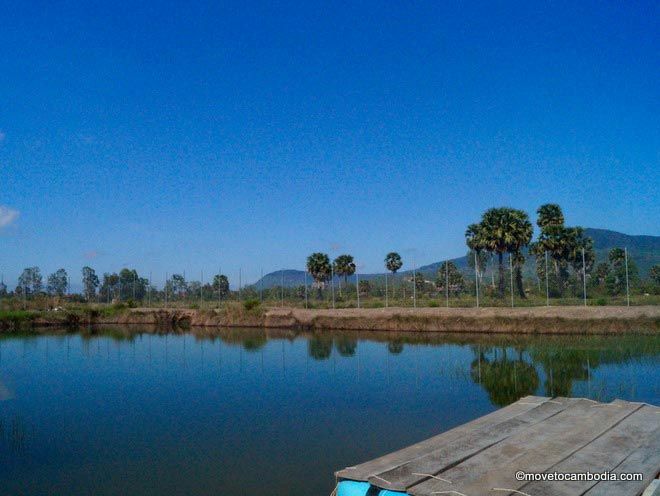 Whether fear of mud, animals, or some other unknown terror keeps you out of the river, simply head over to one of Kampot’s swimming pools open to visitors for a relaxing cool down in the water. 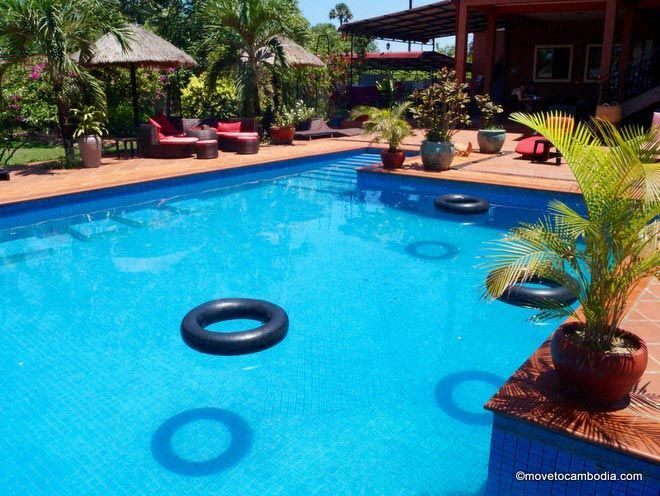 Go for a dip in Kampot at Villa Vedici. The number swimming pools in Kampot is baffling considering the proximity of the river, but that does not stop visitors from taking advantage of these convenient places to escape the heat. 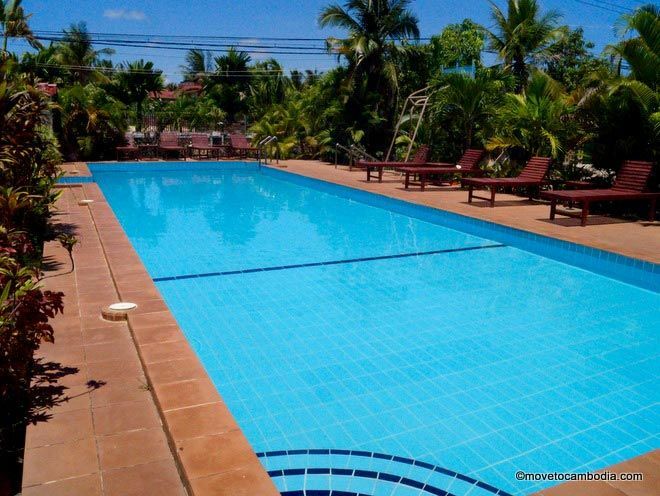 The list below does not include every pool found in Kampot since some allow only their guests access. The following pools are open to visitors looking to take a clean, chlorofied dip. Fancy swimming in both the river and a pool? Villa Vedici Resort offers both. The beautiful, wooden buildings and carefully landscaped grounds immediately make me feel like I’m at my rich friend’s parent’s lake house after prom. Villa Vedici actually did start as the summer home for the Dutch family that owns it, and they turned it into a guesthouse in 2009. Expect to pay $3 as a non-guest to access the shimmering pool, the floating dock on the river, and tons of other games and activities available on the property, including foosball, four-wheelers, billiards, kayaks, and even a piano. Big and beautiful: The Chey Mean Leap pool. The newly built Chey Mean Leap Villa opened for Khmer New Year 2017 with its bright pink buildings and pristine swimming pool. 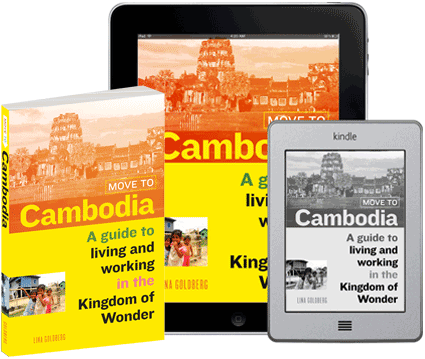 The Khmer-owned resort stands on the Red Road just before Villa Vedici and does not extend all the way to the river. A small restaurant provides cool drinks or small snacks, but there is no bar. The rooms are pricey and, thankfully, you do not need to book one to use the pool. They charge $3 for guests not staying at the resort ($2 for children). Fancy going to a bar in a pool? Billabong Guesthouse is the only place in Kampot where you can order drinks without leaving the safety of the chilled water and still sit on a barstool. A small stone waterfall decorates the edge of the pool with tons of water toys available at no cost. Billabong does not charge outside guests to use the pool as long as they purchase something from the bar or restaurant. Get front row seats for Billabong’s musical Sunday Sessions since the pool is right next to the stage. Hang out by this lovely pool for just $2 per person. Another Khmer-owned hotel located at the eastern end of Backpacker/Hostel Street, Kampot Guesthouse, allows guests from any of the surrounding hostels to use their facilities for only $2 per person. The crystal-clear pool is about 20 meters long and seems perfect for doing laps. Plenty of lounge chairs surround it for sunbathing, along with small gazebos to escape the sun. They do serve food and drink, but do not have a bar. Mad Monkey, the epitome of the backpacker hostel, is located just outside the main city center and along Riverside Road. They have not one bar, but two, along with everything else the young flashpacker needs to meet people and socialize. A small, square pool about five feet deep sits outside the downstairs bar with plenty of space for tanning or an epic volleyball game in the water. They do not charge outside guests for using the pool and offer cheap drinks and special event nights almost every day of the week. The water at Ganesha’s natural pool is a pleasure to experience. A natural pool offers the perfect combination of earthly beauty and man-made security for those who still want the feeling of being in the river without the anxiety. Kampot boasts two natural swimming pools with lush greenery surrounding, Bohemiaz and Ganesha. Both sit several kilometers outside the city center, so you’ll need to rent a motorbike, a bicycle if you feel fit, or flag down a tuk tuk. Travelers looking for a lush, green-rich environment to relax or go swimming need look no further than Ganesha Eco-Guesthouse. The current owners started building the natural pool about three years ago and it’s now open to the public. The 600 meter-squared natural pool is 3.5 meters deep at its fullest with a thick bottom of clay. The natural filtration system uses solar power and limestone to balance out the acidity caused by the clay. This results in water so soft it feels like a blanket caressing your skin. Ganesha does not charge for outside guests to use the pool or to walk under cover of the hundreds of trees they plant every year. 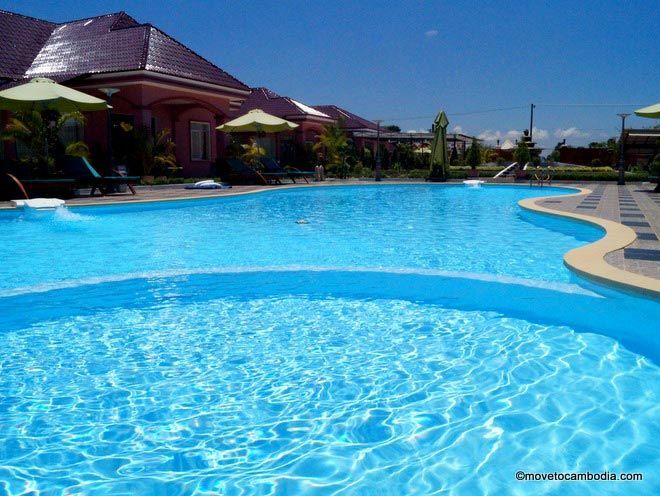 Bohemiaz Eco Retreat and Guesthouse is an eco-resorts with a lovely natural pool. Located near the bottom of Bokor Mountain on the other side of Teuk Chhou River, the 18-meter long natural swimming pool is kept clean without the use of salt or chemicals. Plants live in an attached filter pool to naturally clean the water alongside a unique, man-made gravel filter. The pool gleams extra blue in the sunlight thanks to a special dye that prevents algae from growing. Feel free to open your eyes underwater without them stinging! 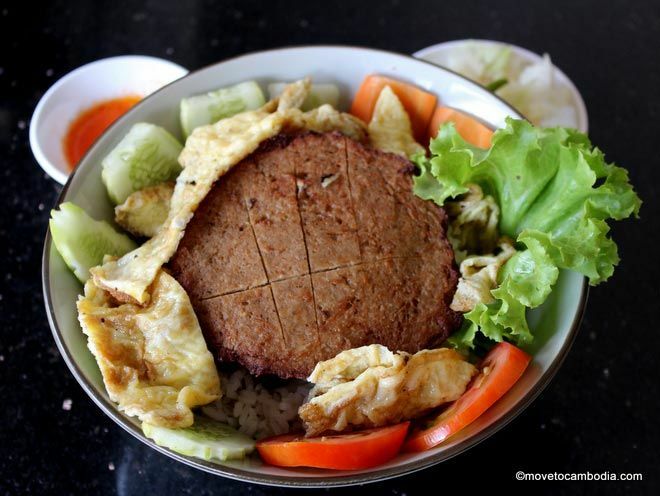 This entry was posted in Kampot and tagged swimming, Mad Monkey, Villa Vedici, Chey Mean Leap Villa, Billabong Guesthouse, Kampot Guesthouse, Ganesha Eco-Guesthouse, Bohemiaz. Bookmark the permalink.